From charging stands and display pads to additional straps and Watch bumpers, you have no shortage of extras to choose from. 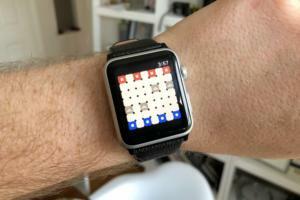 So, you just preordered your first Apple Watch. Now what? You’ll need some accessories for it, of course! The Apple Watch won’t even ship until April 24, but that hasn’t stopped manufacturers from designing accessories and add-ons for Apple’s latest must-have. From charging stands and display pads to additional straps and Watch bumpers, you have no shortage of extras to choose from. 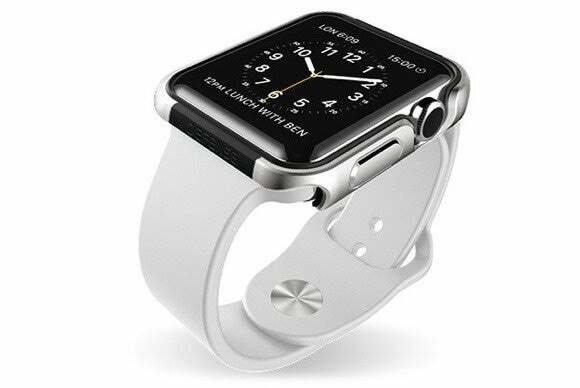 Read on to check out the first batch of third-party accessories for the Apple Watch. The Apple Watch has been hailed as an awesome fitness device, so if you’re planning on wearing yours while out hiking (or doing something more extreme, like rock climbing), you might be interested in The Bumper (price unavailable). This rubber bumper surrounds and protects the edges of your Watch. The Bumper is easy to install, provides a precise cut-out for the Watch’s Digital Crown, and doesn’t block any of its sensors. It also doesn’t interfere with your Watch’s audio quality or microphone. The Bumper was funded through Indiegogo, and early backers should expect theirs to ship by May; if you missed out, you can pre-order yours now. The Timeless Collection includes two elegant leather accessories that solidify your Watch’s status as a timepiece: The Tempo and the Moment (pictured here). The Tempo ($129) is a padded leather carrying case for your Watch. It folds like a wallet, and has a belt-like clasp that keeps it firmly closed when packed away. 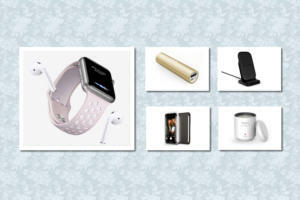 It also includes three soft compartments for your Watch, charging cable, and other knickknacks. The Moment ($129) is a gorgeous arch-shaped charging stand on which you can rest your Apple Watch whenever it’s not on your wrist. The stand features magnets to anchor the Watch and keep it lined up with the charger, and a groove for your charging cable to keep it neatly tucked away. Both the Tempo and the Moment ship on May 1. Sure, Apple has a bunch of different Watch bands to choose from—but why stop your shopping there? Casetify offers a wide range of completely customizable bands at $50 each, for both the 38mm and 42mm Watch. When creating your design, you can link up your Instagram account to pick a photo. 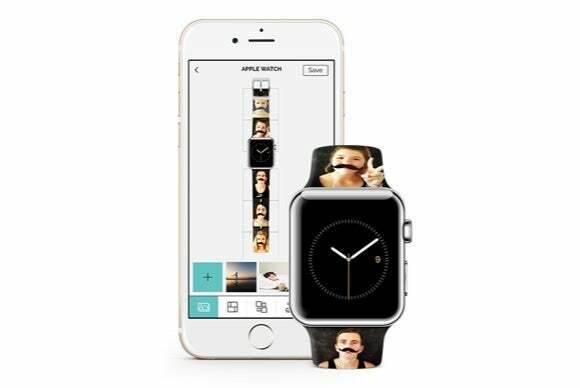 The bands can be adorned with a picture of your kids, your pets, a vacation photo—you name it. You could even go with your fave selfie. 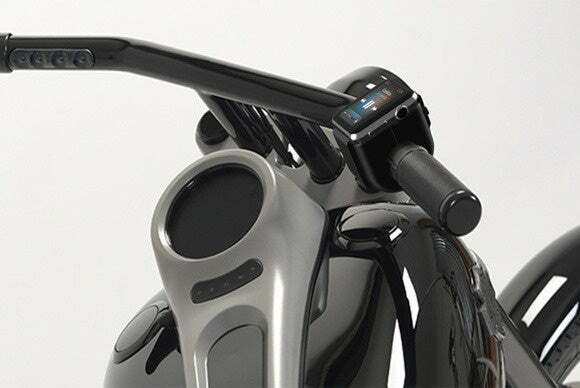 Cyclists, this one is for you: The Var CyClip (price unavailable) is an adapter that lets you secure your Watch to your bicycle, scooter, or motorcycle’s handlebars. The Charging Stand ($70) is an upright wooden, er, charging stand, with a weighted base that minimizes the chance of tipping over. 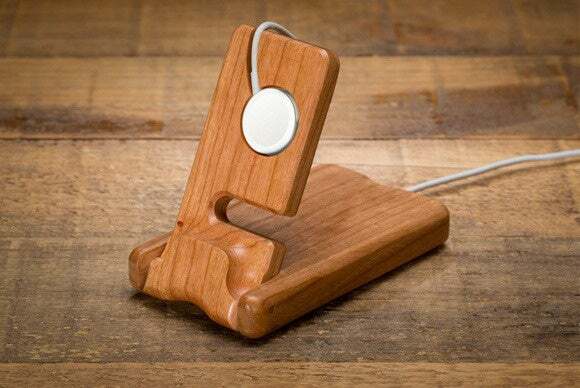 Made with American walnut wood, the Charging Stand includes a carved hidden wire-routing path and a dedicated spot for your MagSafe charging cable. 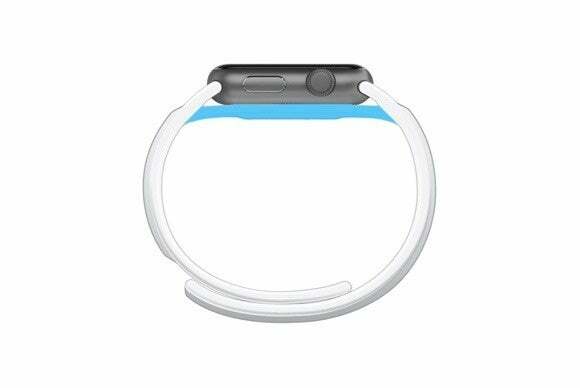 It fits all of Apple’s Watch bands, and can even be used as a cable wrap when you’re traveling. 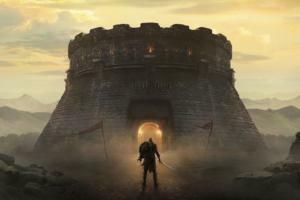 The stand will ship four to six weeks after the Watch officially debuts on April 24. 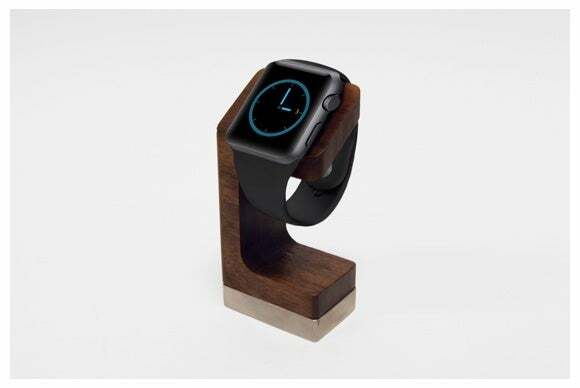 The WatchStand ($30) is a minimalist stand that can store and recharge your Watch. Just run your charging cable through the stand, attach the cable connector to the stand’s cradle, and tuck the rest of the cable inside the stand’s post. When you need some juice, just place your Watch on the angled cradle, and it will snap into place and start charging. 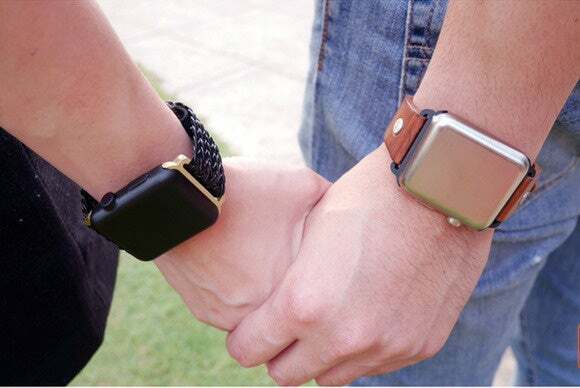 You can attach it whatever way you want—with either the band clasped or unclasped. Plus, you can rest your iPhone on the WatchStand’s base to keep both devices within reach. The WatchStand will ship later this year. 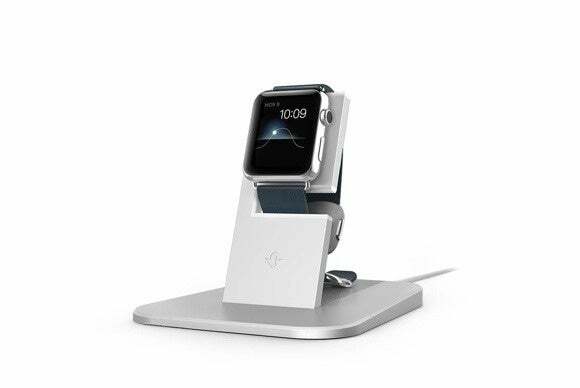 The HEDock ($29) is an upright charging station with a simple zig-zag design that supports your Watch and matches its sleek look—especially if you bought the Apple Watch Sport, since it’s made with brushed aluminum. The HEDock sports a scratch-resistent coating and a seat for your charging cable. It also has an in indentation for your Watch band, making sure every part of your Watch is has its own resting place. You can reserve your dock now, and it will ship later this year. The Luxury Pocket Stand ($70) is handmade from a single piece of wood, finished with furniture-grade oil for a luxurious look. 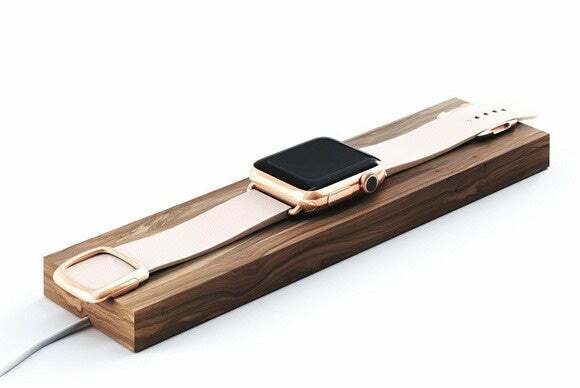 The Luxury Pocket Stand folds shut for easy transportation, can hold your Watch and any of Apple’s bands, and comes in American Cherry or African Mahogany. Ships in mid-May. If you’d rather have a horizontal docking stand, check out the Composure ($79). Made of walnut and steel, the Composure sports a weighted foundation with a hidden wire track for your charging cable, and plenty of room for your Watch to rest. The Composure will ship within 60 days after the Watch launches on April 24. The Click (starting at $12) is an adapter set that allows you to use any 22mm watch band with your Apple Watch. 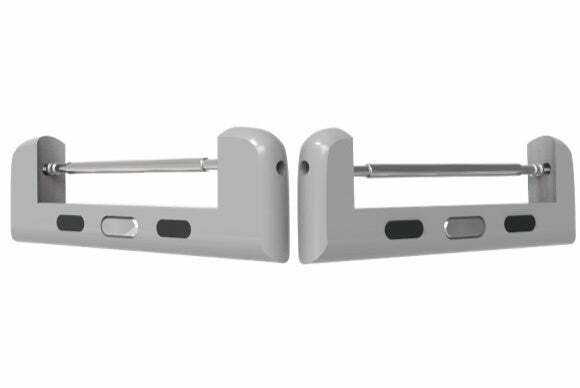 The adapters are supposedly easy to install and remove, and will be available for both the 38mm and 42mm Watch. As for materials, pick between polymer, aluminum, and stainless steel (sorry, Edition fans, it doesn’t look like there’s a rose gold option). The Click just hit its Kickstarter funding goal, but it still has a few days left on its campaign—if you back it now, you’ll receive your Click adapters by May. 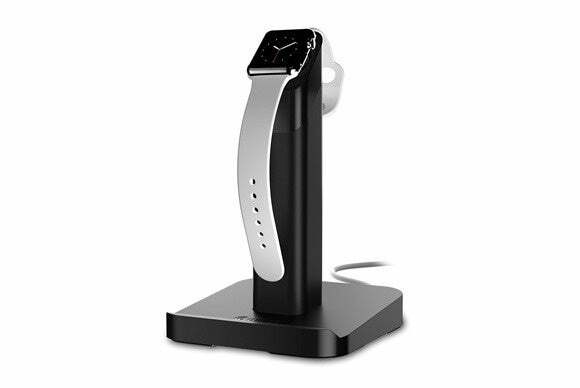 The Bandstand (price unavailable) is a sleek charging dock that is compatible with the Watch’s MagSafe and inductive charging technology. 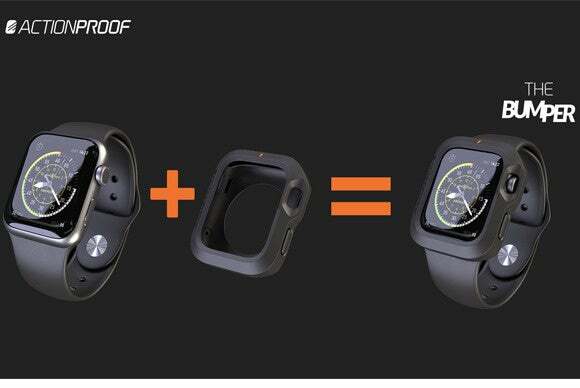 It lets you quickly and securely cradle your Watch when you’re not using it. 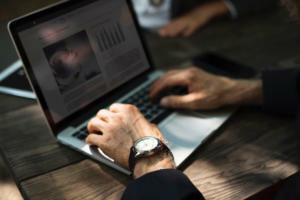 The upright Bandstand is compatible with all of Apple’s Watch bands, sports a generously-sized base with room to rest your iPhone or iPad, and even features two USB ports for you to connect your USB to Lightning cables. 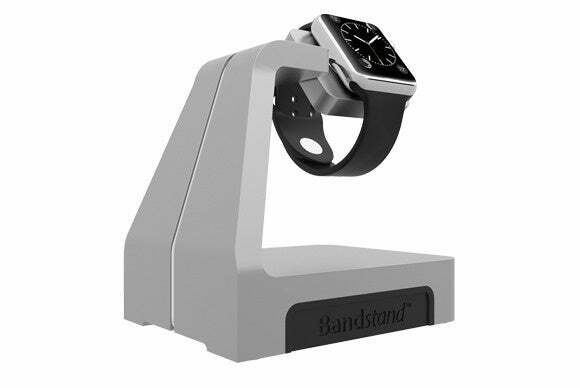 Standzout was thinking ahead with this design: Bandstand has an interchangeable charging platform, just in case the technology changes down the line. Bandstand will be available to purchase later this summer. The adapters also come with a Hook option that will let you wear your Watch around your neck as a necklace (with your own chain, of course). If it gets funded, you can pick between silver, gold, or black adapters, and it will ship in June. The HiRise ($50) looks right at home among Twelve South’s accessory family. 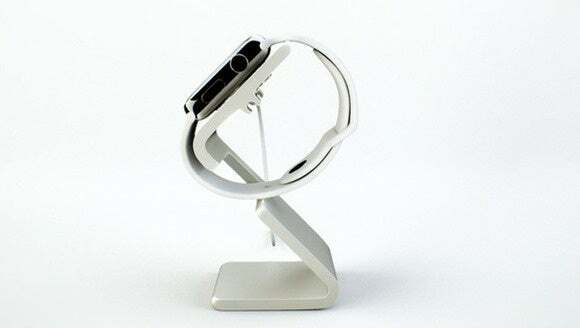 This stylish brushed-metal stand elevates and tilts your Apple Watch at a comfortable viewing angle, which lets you quickly check incoming notifications and messages while it charges. 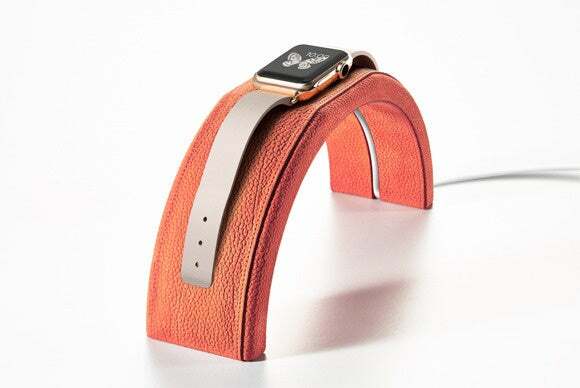 It sports a round opening for the Watch’s inductive charging cable, and features silicone accents and a leather landing pad to cushion your Watch band. The HiRise stand comes in black or silver to match your other Apple gear, and ships in May. There will come a time when you won’t want to wear your Watch, but you’ll want to take it with you somewhere. That’s when you’ll want a safe place to store it, like the cleverly-named Time Travel ($49-$59). 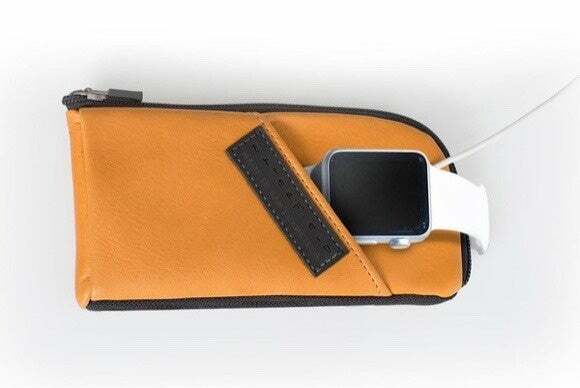 This travel case includes a plush pocket for your Apple Watch (or your iPhone), two smaller pockets for your charger and other accessories, and a long pocket for your spare bands. The Time Travel comes in a few different leather shades—black, camel, gray, red, forrest green, and cowboy brown—or black nylon. 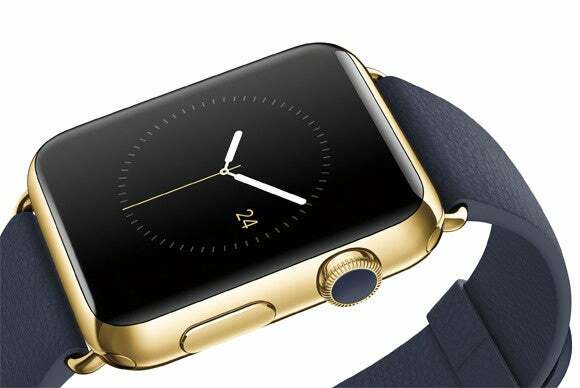 It will ship shortly after the Apple Watch ships on April 24. The Defense Edge ($30) is an aluminum bumper that protects the edges of your Watch to help avoid damage from drops or impact. Easy to snap on and off, the Defense Edge includes a soft rubber lining for additional protection and comes in gold or silver hues designed to seamlessly match the beautiful industrial design of your Watch.